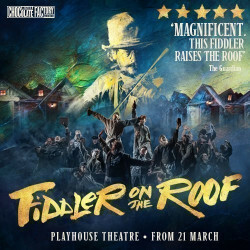 If you adored the brilliant 1964 Broadway show, or the 1971 Oscar-winning movie of the same name starring Topol, you'll be thrilled to hear there's a fresh new version of Fiddler on the Roof coming to the capital at long last. It sold out at the Menier Chocolate Factory, on the fringes of theatreland, now it's going mainstream, due at the Playhouse theatre and still, if the critics are to be believed, one of the best-loved musicals around. The Grade 2 listed Playhouse Theatre features a striking exterior that curves gently around Northumberland Avenue into Craven Street. Inside there are a series of beautiful paintings and a glorious flowery safety curtain, plus scary-looking lights shaped like horse’s skulls. First called the Royal Avenue Theatre, and soon after wards being renamed the Avenue Theatre, the current gorgeous building was designed by Blow and Billerey and opened back in 1882. Specifically designed to house comic operas and burlesques at first, it soon followed the fashion of the day and turned its face towards serious theatre, with the famous George Bernard Shaw creating his first play especially for the venue. W. Somerset Maugham premiered his work there and classics by Tennessee Williams, Ibsen and Chekhov all took the stage to considerable acclaim. 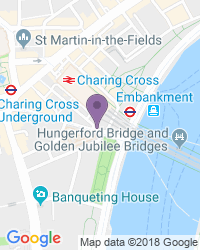 Twenty five years after its opening the building was being renovated when part of Charing Cross railway station collapsed on top of it. Six of the workers were killed, which delayed the re-opening until 1907, at which point it was renamed the Playhouse Theatre. In the 1950s the BBC bought the theatre for radio and live TV recordings, which included the hit comedy series Steptoe and Son. During the 1960s it was used for live gigs and hosted performances by household names like Led Zeppelin, The Beatles and The Rolling Stones. The BBC left in 1976 and the building was deserted, threatened with demolition. But the decision to add an extra storey saved its life, being rented out to businesses to provide essential extra revenue. Thanks to this innovation the Playhouse Theatre opened again in 1987and has hosted a wide variety of shows, from musicals to Shakespeare plays, ever since. Amazingly, the complex machinery under the stage is original. Jeffrey Archer owned the theatre from 1988 to 1992. In 2003 Maidstone Productions became the new independent owners, with the famous Broadway producers Ted and Norman Tulchin putting on a dazzling string of hit productions. These days it is owned by the Ambassador Theatre group. Over the years the delightful Playhouse theatre has been home to Gladys Cooper, The Almeida Theatre Company, The Peter Hall Company and more. Hit shows have included Gagarin Way, The Unexpected Man, Dinner with Friends (which won the coveted Pulitzer Prize), and Turgenev's Fortune's Fool on Broadway with Alan Bates and Frank Langella, both of whom won Tony awards for their performances. Recent productions include Richard Eyre's Vincent in Brixton. You’ll find wheelchair spaces in the stalls, rows G and J, with space for a companion. Plus six transfer spaces. You can store your scooter or wheelchair in the rear of the stalls. We’re a trusted destination for a wide variety of seat types and prices, with excellent availability on the full range of Playhouse Theatre tickets.